Follow @rhymeswithfiat to receive new crypto comics on Twitter. The last all-time high for bitcoin prices was on December 17, 2017. The all-time high for “bitcoin memes” was also on that date, according to Google trends. The last manned mission to the moon was Apollo 17 launched on December 7 of 1972, 45 years later. I think there’s some numerology in there, but you’ll have to figure it out yourself. You can visit Your Daily Moon Math for estimates of the next cryptocurrency lunar mission. Warning: predictions of cryptocurrency price are about as reliable as using goat entrails to predict the weather. Maybe less reliable. 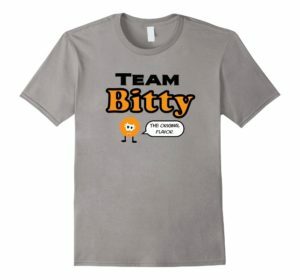 T-shirts are now available on Amazon: Team Bitty, The Original Flavor and Team Ethel, The Next Evolution. Click the shirts to purchase. 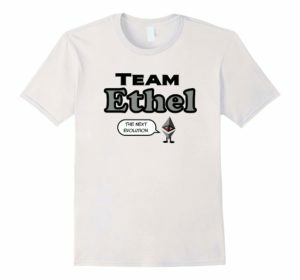 The shirts are priced as low as possible so that I make a whopping 9 cents (that’s 700 satoshi!) per sale. Your purchase supports this site with an affiliate referral so that there is no extra cost to you. You can also purchase from Amazon with bitcoins using purse.io.